﻿ Rhapsody In Taps Schedule. Find out what the company is currently up to and some performances of the past. Online registration for RIT Tap Day has ended. Classes still available for registration at the door. 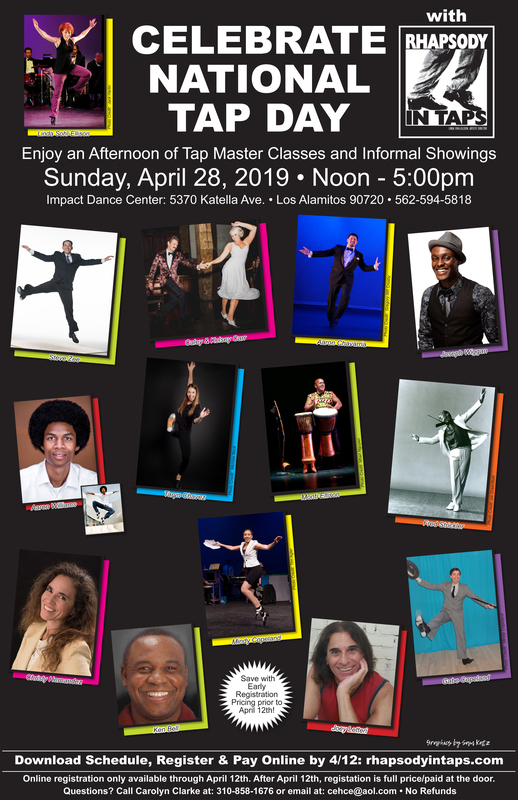 Rhapsody In Taps & Guests Celebrate National Tap Day! Linda Sohl-Ellison and Monti Ellison teach and perform Rhapsody In Taps’ repertoire at this event. Linda teaches RIT repertoire master class (Adv/Pro, 1pm-2:25pm). Arrive early; register and pay at the door. 8:00pm Rhapsody In Taps performs concert Celebrating 36 Years! Juba! Performance Friday eve. July 21. 12pm-5:00pm Rhapsody In Taps & Guests Celebrate National Tap Day! Linda and Monti perform "Wade"
12pm-5:45pm RIT Celebrates its 35th Anniversary and National Tap Day! Designed for 4th - 8th grade students. Teacher reservations required. April 13, 2014 Rhapsody In Taps Performs at the Colburn Tap Fest. Rhapsody In Taps Performs at the Colburn Tap Fest. 5:30 pm Zipper Hall, The Colburn School 200 South Grand Avenue Los Angeles, CA 90012. The Colburn School: 200 South Grand Avenue Los Angeles, CA 90012. October 19, 2012 2 Rhapsody In Taps' Children’s Shows / FREE! Designed for 4th and 5th grade students. Reservations required. All events are open to the public and are FREE unless noted. *Participants must be 18 years of age or over. 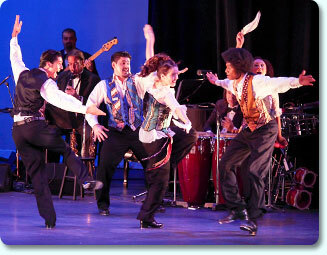 Co-produced by Rhapsody In Taps and Los Angeles Choreographers and Dancers. *Admitance to WAA Showcase performances is limited to paid attendees for the 2010 Western Arts Alliance Conference in Long Beach. 8:00pm RIT guest performance "Deciduous Dances"
Linda Sohl-Ellison and Monti Ellison perform "Espiritu,"
Nov 3, 2007 RIT performs "Laughing With Tears"
Nov 4, 2006 RIT performs "Tribute to Gregory Hines"